This delightful Disney Fairies Toddler Bed will have the little princess in your life excited about getting her beauty rest. 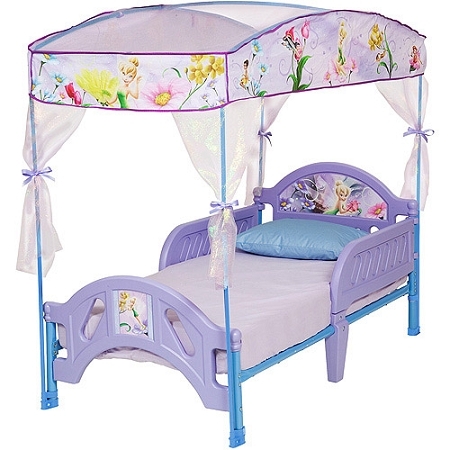 The Fairies toddler bed has a sheer canopy that's adorable. The Tinker Bell Fairies toddler canopy bed is built low to the ground providing easy access for your child and has side-rails to help prevent tumbles. Your child's favorite fairy Tinker Bell adorns the headboard, footboard and canopy. The sheer shiny canopy has polyester organza netting and decorative ribbons tie it to the four posts of the beautiful bed. The bed has a strong steel frame and this cute Disney toddler bed is designed to fit a standard crib mattress. This toddler bed is easy to assemble, has a non-toxic finish, and meets all safety standards.